Taking place at the Singapore Indoor Stadium in Kallang, Singapore, “ONE: Heart of the Lion” was the second and the last ONE Championship event in Singapore in 2018. In the 13th bout of the evening, the crowd witnessed the long-awaited rematch between Belingon and Fernandes. Belingon entered the cage at “ONE: Heart of the Lion” as the ONE Interim Bantamweight World Champion. The Team Lakay warrior challenged Fernandes who was then the ONE Bantamweight World Champion. After five five-minute rounds, the bantamweight championship bout between Belingon and Fernandes was left in the hands of the judges. In the end, referee Olivier Coste raised the hand of the Filipino challenger as the winner via split decision. By winning in the main event of “ONE: Heart of the Lion,” Belingon improved his professional MMA record to 20 wins and 5 losses. He is now riding a seven-bout winning streak. On the other hand, losing to Belingon downgraded Fernandes’s record to 22 wins and 4 losses. This marked the Brazilian fighter’s first loss in ONE Championship. Fernandes was the 11th MMA fighter to lose to Belingon in the ONE Championship cage. The first one the Team Lakay warrior defeated in the promotion was Yusup “Maestro” Saadulaev, 33, of Makhachkala, Dagestan, Russia. 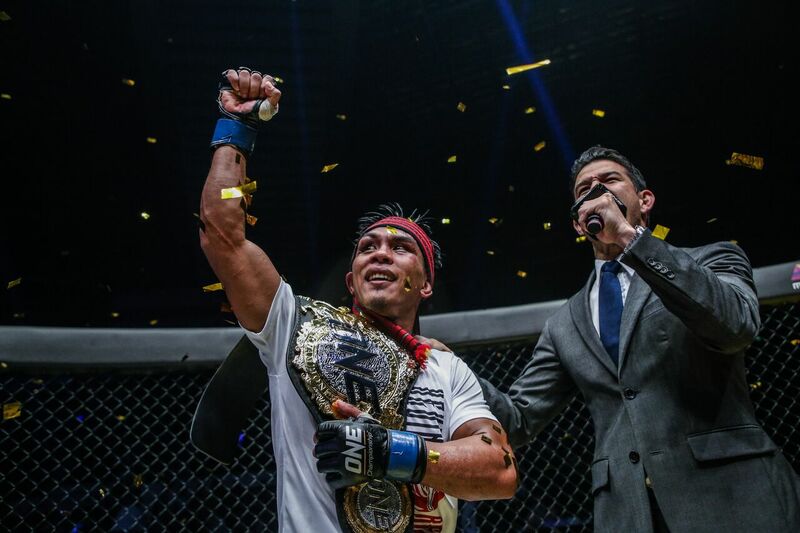 Before the rematch with Fernandes, Belingon became the ONE Interim Bantamweight World Champion by defeating Martin “The Situ-Asian” Nguyen, 29, of Australia and Vietnam, the reigning ONE Featherweight World Champion. The other ONE Championship fighters Belingon defeated were Than “Aladdin” Vu, 26, of Sydney, New South Wales, Australia, David Aranda Santacana, 42, of Barcelona, Spain, Koetsu Okazaki, 29, of Osaka, Japan, Muin “Tajik” Gafurov, 22, of Dushanbe, Tajikistan, Toni “Dynamite” Tauru, 33, of Utti, Finland, Reece “Lightning” McLaren, 27, of Toowoomba, Queensland, Australia, Kevin “Oldboy” Chung, 25, of Centreville, Virginia, USA and Andrew Leone, 29, of Cortland, New York, USA. Several MMA fighters who formerly competed in the Ultimate Fighting Championship were among the special guests during the “ONE: Heart of the Lion” fight night. One of them was former UFC flyweight champion Demetrious “Mighty Mouse” Johnson, 32, of Kirkland, Washington, USA, who is Fernandes’s training partner at AMC Pankration in Kirkland, Washington, United States. Free agent Sage “Super Sage” Northcutt, 22, of Katy, Texas attended the “ONE: Heart of the Lion” fight night as well as newly appointed ONE Championship vice president Miesha “Cupcake” Tate, 32, of Las Vegas, Nevada, USA and her husband Jonathan “Johnny Boy” Nunez, 33, of Las Vegas. The three MMA fighters previously competed in the UFC.